The dataset consists of details of the most recent reports on covered outpatient active drugs by manufacturers participating in the Medicaid Drug Rebate Program of the Centers for Medicare and Medicaid Services (CMS) according to Section 1927 of the Social Security Act. 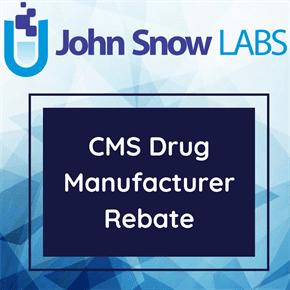 The rebate drug product data file contains the active drugs that have been reported by participating drug manufacturers as of the most recent rebate reporting period under the Medicaid Drug Rebate Program. Starting with the 3Q2014 drug product data file that will be posted in early November 2014, the file format for the drug product data file will be changed to include new FDA Application Number/OTC Monograph Number and Reactivation Date fields and to replace the Drug Efficacy Study Implementation (DESI) rating with the Covered Outpatient Drug (COD) status. Please note that the COD status and corresponding FDA Application Number/OTC Monograph Number field will contain blanks for those NDCs for which the manufacturers have not yet reported those fields to CMS. You may refer to the data definitions for more information regarding the valid values for each of these fields. The drug product data file contains individual files for the current quarter plus the previous eight quarters. Please save and archive these files, including the file formats, for any future use you may have as we do not archive these files once posted and cannot honor individual requests for regenerated files. (Note: Only active drugs and drugs with a termination date on or after the last processed quarter are included in the file). All drugs in the dataset are identified by National Drug Code (NDC), unit type, units per package size, product name, Food and Drug Administration (FDA) approval date, the date the drug entered the market, plus indicators to show whether the drug is an innovator or non-innovator drug; whether it is available by prescription or over-the-counter (OTC); the FDA therapeutic equivalency code; and the Drug Efficacy Study Implementation (DESI) rating and termination date, if applicable. Centers for Medicare & Medicaid Service. Medicaid Drug Rebate Program. Published February, 2015. Accessed February 23, 2016. Wikipedia Medicaid Drug Rebate Program. https//en.wikipedia.org/wiki/Medicaid_Drug_Rebate_Program. Published November, 2013. Accessed February 23, 2016. Centers for Medicare & Medicaid Service. Drug Product Data Webfile Structure and Definitions. Published November, 2014. Accessed February 16, 2016.